If you’re anything like me, the weekly grocery shop fills you a strange combination of fear, dread and relief. Fear kicks in on those shopping trips that I need to bring my two sons with me. Dread occurs if I: a) leave my shopping list at home, b) buy double quantities of stuff I don’t really need and c) forget my shopping bags. On the worst days, all three things collide at once. #Fun. And relief? Well, getting through this pesky weekly routine means we will have food in the house and I will feel like I am a little bit ahead of the game again. Check your eggs: Salmonella alert! 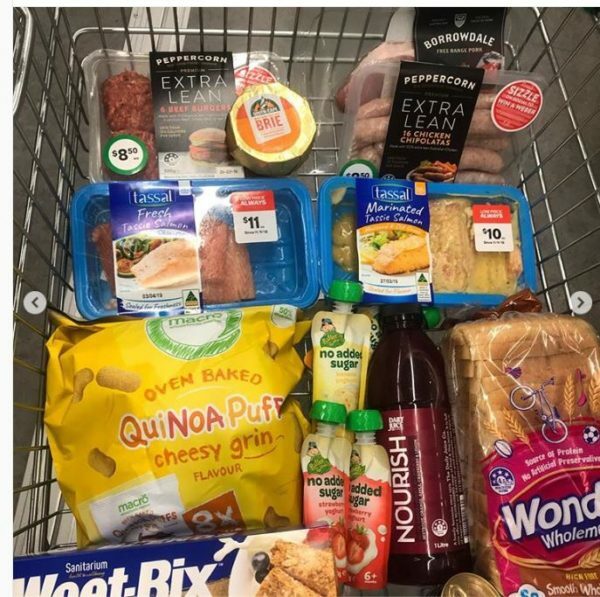 When Susie Burrell shared a photo of her weekly shop, I jumped at the chance to peek inside her trolley. Susie is a nutritionist, business owner and also the mum of three-year-old twin boys, Harry and Gus. In short, she’s just as busy as the rest of us. She’s also very budget and health conscious and heads to both Aldi and Woolies to grab the bargains and freshest fruit and veggies she can get. Susie says she splits up her weekly shopping between supermarkets. “I get my staples from Aldi & try and spend about $100 then I duck to Woolies or Coles to get my meat/protein and any extras I need,” she tells followers. As for which brands she prefers, Susie says it’s worth splurging on good quality proteins. As budgets go, $120 a week for a busy family of four (including hungry three-year-old twin boys) is pretty good value. Susie said she shops Thursday to Thursday and the $120 covers dinners and lunches for everyone in the family. Of course, the only question we are left with is where’s the sneaky chocolate stash for mum?